Connection with the Alliance Israélite. 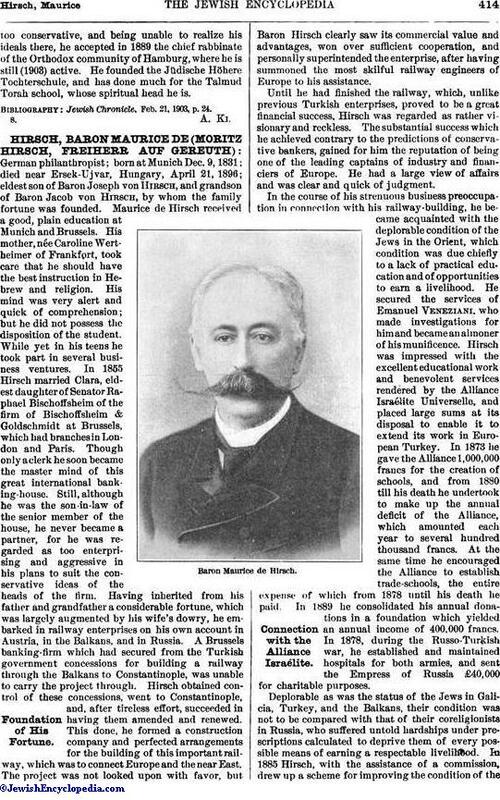 German philanthropist; born at Munich Dec. 9, 1831; died near Ersek-Ujvar, Hungary, April 21, 1896; eldest son of Baron Joseph von Hirsch, and grandson of Baron Jacob von Hirsch, by whom the family fortune was founded. Maurice de Hirsch received a good, plain education at Munich and Brussels. His mother, née Caroline Wertheimer of Frankfort, took care that he should have the best instruction in Hebrew and religion. His mind was very alert and quick of comprehension; but he did not possess the disposition of the student. While yet in his teens he took part in several business ventures. In 1855 Hirsch married Clara, eldest daughter of Senator Raphael Bischoffsheim of the firm of Bischoffsheim & Goldschmidt at Brussels, which had branches in London and Paris. Though only a clerk he soon became the master mind of this great international banking-house. Still, although he was the son-in-law of the senior member of the house, he never became a partner, for he was regarded as too enterprising and aggressive in his plans to suit the conservative ideas of the heads of the firm. Having inherited from his father and grandfather a considerable fortune, which was largely augmented by his wife's dowry, he embarked in railway enterprises on his own account in Austria, in the Balkans, and in Russia. A Brussels banking-firm which had secured from the Turkish government concessions for building a railway through the Balkans to Constantinople, was unable to carry the project through. Hirsch obtained control of these concessions, went to Constantinople, and, after tireless effort, succeeded in having them amended and renewed. This done, he formed a construction company and perfected arrangements for the building of this important railway, which was to connect Europe and the near East. The project was not looked upon with favor, but Baron Hirsch clearly saw its commercial value and advantages, won over sufficient cooperation, and personally superintended the enterprise, after having summoned the most skilful railway engineers of Europe to his assistance. 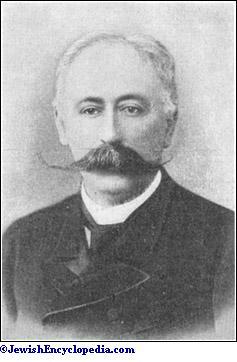 Until he had finished the railway, which, unlike previous Turkish enterprises, proved to be a great financial success, Hirsch was regarded as rather visionary and reckless. The substantial success which he achieved contrary to the predictions of conservative bankers, gained for him the reputation of being one of the leading captains of industry and financiers of Europe. He had a large view of affairs and was clear and quick of judgment. In the course of his strenuous business preoccupation in connection with his railway-building, he became acquainted with the deplorable condition of the Jews in the Orient, which codition was due chiefly to a lack of practical education and of opportunities to earn a livelihood. He secured the services of Emanuel Veneziani, who made investigations for him and became an alomoner of his munificence. Hirsch was impressed with the excellent educational work and benevolent services rendered by the Alliance Israélite Universelle, and placed large sums at its disposal to enable it to extend its work in European Turkey. In 1873 he gave the Alliance 1,000,000 francs for the creation of schools, and from 1880 till his death he undertook to make up the annual deficit of the Alliance, which amounted each year to several hundred thousand francs. At the same time he encouraged the Alliance to establish trade-schools, the entire expense of which from 1878 until his death he paid. In 1889 he consolidated his annual donations in a foundation which yielded an annual income of 400,000 francs. In 1878, during the Russo-Turkish war, he established and maintained hospitals for both armies, and sent the Empress of Russia £40,000 for charitable purposes. 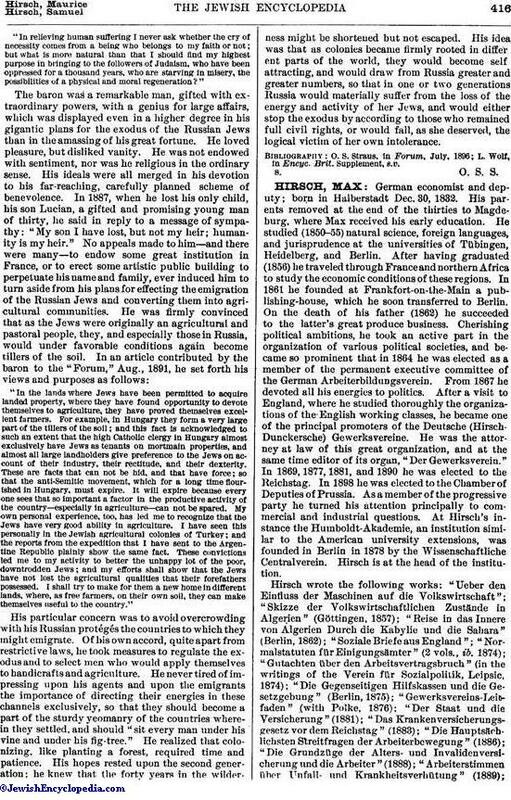 Deplorable as was the status of the Jews in Galicia, Turkey, and the Balkans, their condition was not to be compared with that of their coreligionists in Russia, who suffered untold hardships under prescriptions calculated to deprive them of every possible means of earning a respectable livelihood. In 1885 Hirsch, with the assistance of a commission, drew up a scheme for improving the condition of theRussian Jews. It was his idea at this period that that object might be best attained by measures applied in Russia itself, without resorting to emigration. For the preliminary endowment of this scheme he offered the Russian government 50,000,000 francs to be used for purposes of education. This offer the government declined to accept unless the fund be entrusted to it for exclusive control and distribution. 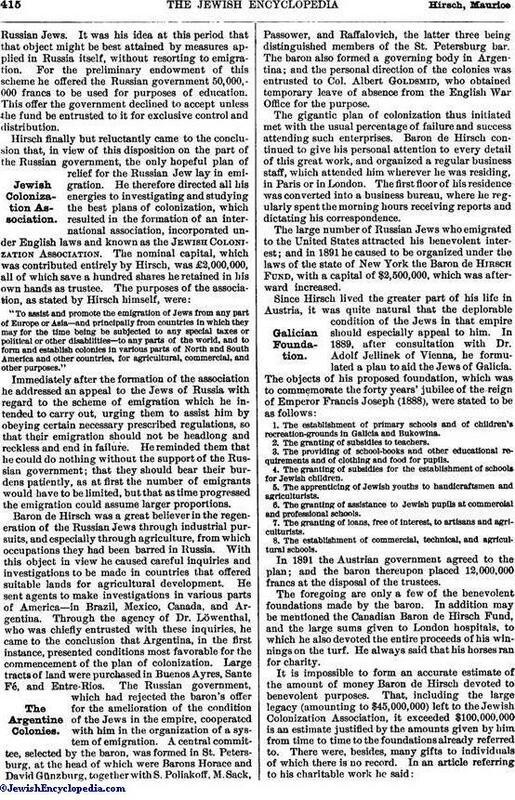 "To assist and promote the emigration of Jews from any part of Europe or Asia—and principally from countries in which they may for the time being be subjected to any special taxes or political or other disabilities—to any parts of the world, and to form and establish colonies in various parts of North and South America and other countries, for agricultural, commercial, and other purposes." Immediately after the formation of the association he addressed an appeal to the Jews of Russia with regard to the scheme of emigration which he intended to carry out, urging them to assist him by obeying certain necessary prescribed regulations, so that their emigration should not be headlong and reckless and end in failure. He reminded them that he could do nothing without the support of the Russian government; that they should bear their burdens patiently, as at first the number of emigrants would have to be limited, but that as time progressed the emigration could assume larger proportions. Baron de Hirsch was a great believer in the regeneration of the Russian Jews through industrial pursuits, and especially through agriculture, from which occupations they had been barred in Russia. With this object in view he caused careful inquiries and investigations to be made in countries that offered suitable lands for agricultural development. He sent agents to make investigations in various parts of America—in Brazil, Mexico, Canada, and Argentina. Through the agency of Dr. Löwenthal, who was chiefly entrusted with these inquiries, he came to the conclusion that Argentina, in the first instance, presented conditions most favorable for the commencement of the plan of colonization. Large tracts of land were purchased in Buenos Ayres, Sante Fé, and Entre-Rios. The Russian government, which had rejected the baron's offer for the amelioration of the condition of the Jews in the empire, cooperated with him in the organization of a system of emigration. A central committee, selected by the baron, was formed in St. Petersburg, at the head of which were Barons Horace and David Günzburg, together with S. Poliakoff, M. Sack, Passower, and Raffalovich, the latter three being distinguished members of the St. Petersburg bar. The baron also formed a governing body in Argentina; and the personal direction of the colonies was entrusted to Col. Albert Goldsmid, who obtained temporary leave of absence from the English War Office for the purpose. The gigantic plan of colonization thus initiated met with the usual percentage of failure and success attending such enterprises. Baron de Hirsch continued to give his personal attention to every detail of this great work, and organized a regular business staff, which attended him wherever he was residing, in Paris or in London. The first floor of his residence was converted into a business bureau, where he regularly spent the morning hours receiving reports and dictating his correspondence. The large number of Russian Jews who emigrated to the United States attracted his benevolent interest; and in 1891 he caused to be organized under the laws of the state of New York the Baron de Hirsch Fund, with a capital of $2,500,000, which was afterward increased. 1. The establishment of primary schools and of children's recreation-grounds in Galicia and Bukowina. 2. The granting of subsidies to teachers. 3. The providing of school-books and other educational requirements and of clothing and food for pupils. 4. The granting of subsidies for the establishment of schools for Jewish children. 5. The apprenticing of Jewish youths to handicraftsmen and agriculturists. 6. The granting of assistance to Jewish pupils at commercial and professional schools. 7. The granting of loans, free of interest, to artisans and agriculturists. 8. The establishment of commercial, technical, and agricultural schools. In 1891 the Austrian government agreed to the plan; and the baron thereupon placed 12,000,000 francs at the disposal of the trustees. The foregoing are only a few of the benevolent foundations made by the baron. In addition may be mentioned the Canadian Baron de Hirsch Fund, and the large sums given to London hospitals, to which he also devoted the entire proceeds of his winnings on the turf. He always said that his horses ran for charity. "In relieving human suffering I never ask whether the cry of necessity comes from a being who belongs to my faith or not; but what is more natural than that I should find my highest purpose in bringing to the followers of Judaism, who have been oppressed for a thousand years, who are starving in misery, the possibilities of a physical and moral regeneration?" "In the lands where Jews have been permitted to acquire landed property, where they have found opportunity to devote themselves to agriculture, they have proved themselves excellent farmers. For example, in Hungary they form a very large part of the tillers of the soil; and this fact is acknowledged to such an extent that the high Catholic clergy in Hungary almost exclusively have Jews as tenants on mortmain properties, and almost all large landholders give preference to the Jews on account of their industry, their rectitude, and their dexterity. These are facts that can not be hid, and that have force; so that the anti-Semitic movement, which for a long time flourished in Hungary, must expire. It will expire because every one sees that so important a factor in the productive activity of the country—especially in agriculture—can not be spared. My own personal experience, too, has led me to recognize that the Jews have very good ability in agriculture. I have seen this personally in the Jewish agricultural colonies of Turkey; and the reports from the expedition that I have sent to the Argentine Republic plainly show the same fact. These convictions led me to my activity to better the unhappy lot of the poor, downtrodden Jews; and my efforts shall show that the Jews have not lost the agricultural qualities that their forefathers possessed. I shall try to make for them a new home in different lands, where, as free farmers, on their own soil, they can make themselves useful to the country." His particular concern was to avoid overcrowding with his Russian protégés the countries to which they might emigrate. Of his own accord, quite apart from restrictive laws, he took measures to regulate the exodus and to select men who would apply themselves to handicrafts and agriculture. He never tired of impressing upon his agents and upon the emigrants the importance of directing their energies in these channels exclusively, so that they should become a part of the sturdy yeomanry of the countries wherein they settled, and should "sit every man under his vine and under his fig-tree." He realized that colonizing, like planting a forest, required time and patience. His hopes rested upon the second generation; he knew that the forty years in the wilderness might be shortened but not escaped. His idea was that as colonies became firmly rooted in differ ent parts of the world, they would become self attracting, and would draw from Russia greater and greater numbers, so that in one or two generations Russia would materially suffer from the loss of the energy and activity of her Jews, and would either stop the exodus by according to those who remained full civil rights, or would fall, as she deserved, the logical victim of her own intolerance. L. Wolf, in Encyc. Brit. Supplement, s.v.